Early varieties of potatoes do not store well and they should be eaten soon after harvesting but do allow them a couple of days exposed to the sun. Second early varieties store slightly longer but are also best eaten fresh from the ground after a couple of days. Maincrop potatoes store much better and for longer than early potatoes. 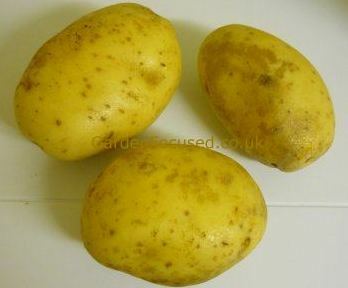 Some varieties store better than others, see our page on potato varieties to see which we recommend. Harvesting potatoes is simple, just dig them up when you need them! Maincrop potatoes will store longer if you follow the rules we describe below. Early potatoes store for about 5 days in a cool, dry and dark position so harvest them when needed. They really do taste best when harvested and then eaten a day or so later. Begin to harvest early potatoes two to three months after planting them in the ground. Generally this is a week or two after the flowers appear. Some potato varieties rarely produce flowers other varieties produce lots. But flowering is a very unreliable method of determining if the potatoes are ready for harvest, sometimes normally reliable flowering varieties produce no flowers at all. Time from planting is the best method. For the first harvest, check out if the potatoes are ready by using a trowel or your hand and then gently burrowing around the roots of a strongly growing plant with your hands. You should be able to feel the size of the largest potatoes and decide if harvest can begin. All potatoes are best harvested when the soil is not too damp. Dig a fork into the ground about 30cm / 12in away from the potato plant stem and angle the fork slightly towards the stem as you dig in. You are trying to get near the potatoes growing under the ground but not so near that you pierce them with your fork. Gently lever the soil up which should expose some of the potatoes. Burrow around the soil with your hands and harvest the potatoes. Clean up potatoes of excess soil by brushing it off with your hands and let them dry before storing. Don't wash them. Early potatoes are best eaten fresh, within a few days of being harvested. They taste better and cook better when eaten that way. However, if you simply have too many to eat or give away there are a couple of options to extend the time over which they can be eaten. Probably the easiest and most successful is to simply leave them in the ground for longer than normal rather than harvest them. Many earlies and second earlies will easily keep in the ground for two weeks past their optimum harvest date. Their skins will tend to harden up and some of the "fresh from harvest" taste will be lost but it's better than simply throwing them away. When the foliage starts to die down harvest those potatoes you can eat. Remove all the dying foliage from the others to reduce the risk of pests and disease. Mark out where the potatoes are underground, because without the foliage you will soon forget where they are growing. Harvest the potatoes whenever required. Another method for extending the keeping period of new potatoes is to harvest them and store them in spent compost (or sand if you have it). The potatoes should be stored in dark and cool conditions. We recommend this over simply re-burying them in the ground. One very definite benefit of using spent compost is that it almost excludes the risk of slug and eelworm damage. The above method should enable storage of new potatoes, in edible condition, for three to four weeks after harvest. Harvest some potatoes before they reach full size. This will reduce the cropping potential but you can start eating your potatoes roughly two weeks earlier than you would normally. It will also tend to increase the size of the potatoes remaining in the ground. Eat the potatoes when they are ready as you normally would do. This is roughly at the beginning of July. Cut off the foliage above ground early July and leave the others in the ground for two weeks longer than you would normally. This will cause the skin to harden slightly and in turn increase their keeping potential. Harvest about half of what you now have in the ground. These should be stored in cool dark conditions. If possible, store them in spent compost (in containers) although storing them loose in well ventilated containers is a good alternative. Leave the remaining potatoes in the ground and harvest when needed. They will not be new potatoes but with a bit of luck will still taste good. The main problem area is likely to be slug and / or eelworm damage. 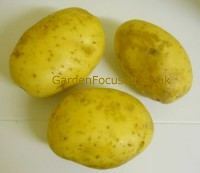 Maincrop potatoes are ready for harvest when the foliage starts to turn yellow. Much depends on the weather conditions throughout the growing season so gently rummage in the soil to feel the size of the potatoes before harvesting the lot. Harvesting maincrop potatoes is similar to harvesting earlies with just a few differences. First, it is important to harvest maincrop potatoes on a sunny day. When the potatoes have been dug up they should have excess soil shaken off and then left to dry on the soil surface in the sun for a couple of hours at the very least, a couple of days is best. This will harden up the skin of the potatoes and help them to store much longer and cook without the surface breaking up. Because maincrop potatoes keep for a relatively long period of time, they can be harvested in large batches and eaten from storage when required. The ideal storage container for maincrop potatoes will exclude the light but at the same time allow moisture to escape. Hessian sacks are probably the best the container for storing potatoes but they do cost. If you can't find anyone who stocks them try clicking The Gardener's Shop. Almost as good are large paper bags, the dull type not the glossy ones. And best of all you can get them free! Take a trip down to your local fish and chip shop and they'll gladly give them away - they have several bags delivered each week and just throw the bags away. Only store potatoes in good condition. If you store some damaged potatoes, they will all become infected. Any damaged ones can be eaten over the next week or so. Store in cool conditions but never in the fridge or freezer. If the potatoes are stored too cool they will turn sweet and not store for very long. The best temperatures for storing potatoes are in the range 5°C to 8°C / 40°F to 45°F. For the average gardener these "ideal" temperatures are hard to achieve. The basic rule is don't let the temperature drop much below 4°C / 40°F and keep them as cool as you can above that temperature. A garden shed in the shade is often a good place. Exclude the light. If light gets to potatoes in storage they will turn green and begin to sprout. This "greening" can often be reversed by placing the potatoes in complete dark for a week or two. The storage bags will exclude some of the light but also store them in a dark position such as a garden shed or a cool cellar. Inspect the stored potatoes regularly. The best method is to turn the bags out once every month and examine each of the potatoes. Discard any which show signs of deteriorating. Again, in practice the average gardener may not have time to do this. At the very least, open the bags once a month and smell the potatoes immediately. Rotting or diseased potatoes can easily be detected by their odour. Remove a few potatoes from the top of the bag and inspect those below.